The Resource Question. The answer to the resource question and the Coast Guard’s involvement in helping disentangle whales is simple in concept, but occasionally complex in the execution. The National Marine Fisheries Service (NMFS) is the federal agency responsible for the conservation and management of living marine resources. The Coast Guard assists NMFS in meeting management goals for protected marine mammals and has authority to perform certain law enforcement activities at sea. Barring a more urgent mission, such as life-saving Search And Rescue (SAR), the USCG participates in these activities in its role as a good steward of the ocean environment. 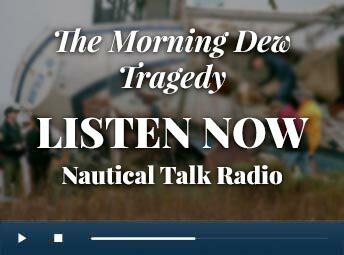 So, those same small coastal SAR stations, the Coast Guard Air Station at Otis, and several coastal patrol boats that perform about 1,500 rescue cases each year from Duxburry, MA. to Watch Hill, RI., have also assisted NMFS and the Center for Coastal Studies (CCS) in disentangling at least 20 Right and Humpback whales over the past several years. In the last five years, Coast Guard commands have assisted CCS in surveilling, tracking and responding to more than 55 whales reported to have been entangled. The Coast Guard and NMFS are equally responsible for enforcing the Endangered Species Act and the Marine Mammal Protection Act. In practice, however, the preservation of these large and rare mammals is a team effort among several agencies, including NMFS, CCS’ Rapid Response Team, the USCG, local harbormasters, and the Massachusetts Environmental Police, to name a few. The “Process” of Freeing Whales. Perhaps the latest and best case will answer the mail about how the Center for Coastal Studies (CCS) and the Coast Guard work together to free whales. On 26 August 1998, Massachusetts Governor Paul Celucci commended the Coast Guard for a 24 July 1998 right whale disentanglement off Corporation Beach Dennis, MA. “Your organization played a critical role…and was particularly impressive with both air and vessel support.” Responding to the report from a local harbormaster of an entangled right whale, the Coast Guard Cape Cod Canal Station notified CCS of a possible entanglement. By 11 AM, CCS had dispatched their R/V Orion simultaneous with Coast Guard Air Station launching an HH60 helicopter and Station Cape Cod Canal launching a 41-foot support boat. Search conditions near Cape Cod Canal were made difficult by flat calm surface conditions, which although ideal for boating, make whale sighting most difficult. These conditions required the utmost coordination, cooperation and communication amongst the search, support and rescue vessels and aircraft. Finally, after locating the whales twice and losing sight of them twice, at 2:20 PM CCS’ team with mutli agency support vessels, were alongside the entangled whale. For nearly two hours, CCS’ Rapid Response Team examined the lines wrapped tightly around the whale’s flukes and attempted to slow down the animal with a series of floats. Eventually, they were able to stop the whale by attaching a large sea drogue to the trailing gear. 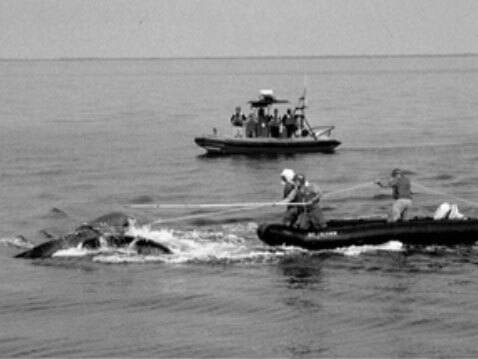 With the whale’s forward motion impaired, the team was able to approach close enough to begin cutting away the gear. About 4:50 PM, after 30 seconds of violent thrashing, all of the lines slipped through the wounds and the whale took off at high speed just beneath the surface. Researchers were able to identify the entangled whale as a six-year old male last seen in the Bay of Fundy in September 1997, with the same gear wrapped around its tale and flukes. The Center for Coastal Studies is the only agency authorized by NMFS to disentangle marine mammals on the east coast. The Coast Guard in Woods Hole and CCS have been working together since1994. Each agency contributes complementing resources to the total effort of whale sighting, tracking and disentanglement. In a series of meetings, the final protocols for identification, reporting, tracking and response to an entanglement were worked out. Coast Guard platforms typically have a greater cargo capacity than the most of CCS’ smaller rapid response chase boats. So, the multi agency work groups designed a protocol which had the CCS’ 1,500 pounds of response equipment forward staged at several Coast Guard stations. 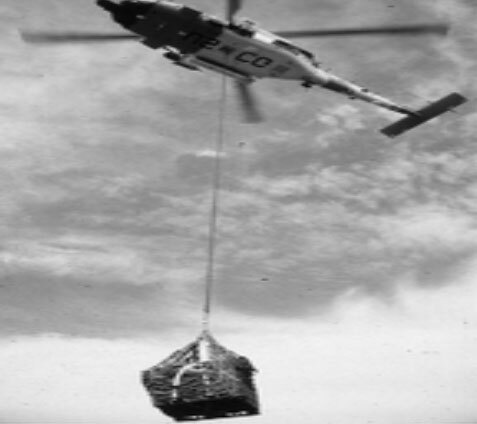 This effort enabled those with the heavy lift capability (Coast Guard boats and helicopters) to have ready access to the equipment needed by CCS, and enabled CCS to focus on getting to the scene knowing that their Coast Guard team mates were en route with the gear. The Whale Disentanglement program has been expanded to include a multi agency Marine Mammal Surveillance program for Cape Cod Bay, launched in 1997, to include the aforementioned agencies and members of the USCG Auxiliary, a civilian voluntary organization. CCS on the other hand, needed help in quantifying the numbers, types and locations of their customers, the whales. As a result, a large number of Coast Guard auxiliarists have been trained to identify the different species of whales and make reports in the standards NOAA format. Also, CG Auxiliarists have recently made their first three patrols to the marine-life rich Stellwagen Bank Sanctuary — knowledge that will help the agencies involved better protect endangered right whales, other species and the environment. The Auxiliarists’ air resources are also used to patrol Stellwagen Bank and auxiliarists occasionally ride Whale Watching boats. The efforts of Coast Guard units in northern waters having been hailed as “exemplar” and these multi agency procedures are being considered for use in other Coast Guard Districts in the southeastern United States in a draft Memorandum Of Understanding between the Coast Guard’s Atlantic Area Commander and NOAA Southeastern region. As a first step, Coast Guard Station Cape Hatteras, North Carolina, has recently pre-staged CCS whale disentanglement equipment for inevitable future requirements. A Look Towards Future Questions and Issues. CCS and the Gerry E. Studds Stellwagen Bank National Marine Sanctuary will co-sponsor a forum Wednesday 6 January 1999 at the Massachusetts Maritime Academy in Bourne. The upcoming forum is designed to review existing guidelines to protect whales from whale watchers. In 1988, NMFS convened a workshop on whale watching which involved researchers, government officials, and industry representatives. The purpose of that work shop was to review whale watching activities in order to provide NMFS with direction on how to better protect whales. The 1988 work group recommended establishing minimum approach distances to whales based on regional considerations (type species, location, habitat use, and behavior) which appear to influence whale reaction to vessels. For the last 15 years, New England’s whale watching fleet has operated under a voluntary set of “guidelines” which recommend safe operating procedures for maneuvering vessels near whales such as: no head-on approaches, no more than one vessel within 300 feet of a whale at any time, and a no-approach zone of 100 feet from a whale. A 1999 discussion panel was held to review NMFS’ 15 year old Whale Watching Guidelines. A focus of this year’s forum was on measures to protect the scarce northern Right Whale. The issue of Right Whale safety is further complicated by that species’ elevated mortality rate which may result from “particular behavioral patterns, such as surface feeding or courtship activities, which render these animals vulnerable and/or unresponsive to approaching vessels.” About 27 percent of known mortalities from western North Atlantic Right Whales have resulted from collisions with vessels. Of the many hundreds of whale watching sorties this past season, there were only two collisions with whales in 1998. When dealing with populations of Right Whales that number 300, many argue that one is too many. One of these collisions occurred at fairly high speed and apparently killed a minke whale, and the other occurred at a slower speed and did not kill a humpback whale. In the first case, a conventionally powered, propeller driven whale-watch vessel proved fatal to the minke whale in an area not concentrated with whales. In the second case, a jet-powered (capable of high speeds) whale watch vessel was proceeding slowly when it struck the whale, but the humpback survived despite the collision. This paradox highlights the complexity of any discussion of speed limits near whales which does not consider at minimum, location, hull and propulsion designs. The conventional standard for safety of speed at sea in international waters is prescribed in the International Collision Regulations. “Every vessel shall at all times proceed at a safe speed so that she can take proper and effective action to avoid collision and be stopped within a distance appropriate to the prevailing circumstances and conditions.” Factors which should be considered in making the determination of what speed is safe include: visibility, traffic density, maneuverability of the vessel, the state of the sea, wind, current, and the vessel’s draft. Perhaps the Coast Guard’s own precautionary operating standards for their cutters while in the vicinity of whales could become a standard. Coast Guard procedures call for cutters to “use caution and be alert for whales, using appropriate speed to reduce the possibility of whale strikes.” When whale activity is at peak in the Great South Channel and Cape Cod Bay, Coast Guard cutters post marine mammal-trained lookouts to watch for whales. In a 9 October 1998 Coast Guard publication, Coast Guard units have been mobilized to develop a whale reporting system with NMFS and NOAA to focus on merchant mariners operating merchant vessels greater than 300 gross tons. The new Coast Guard doctrine pre-dates a recently approved proposal by the International Maritime Organization which requires “commercial ships entering known critical habitats such as the Great South Channel to call in their position before entering the area and to receive whale avoidance guidance.” Coast Guard units will be ready to deliver northern right whale educational packages to merchant vessels in east coast ports. The Coast Guard’s Auxiliary will provide whale educational training and information to recreational fishermen and boaters. The Coast Guard’s cooperative efforts with the Center for Coastal Studies on behalf of NMFS could be expanded to provide support to all east coast areas where whales migrate in the littoral areas. The use of the Coast Guard’s Auxiliary to educate existing and new populations of mariners who operate in or transit marine mammal sanctuary areas is being expanded. A well-educated, sensitized community of whale watching vessels is not enough, if unknowing recreational boaters or merchant vessels run blindly among the endangered mammals.